As he faces a major corruption probe, Ecuadorian President Lenin Moreno (see featured image) is preparing to meet another demand from Washington by booting WikiLeaks journalist Julian Assange out of Ecuador’s embassy in London. Fast forward seven years, and now Ecuador is persecuting Assange and on the brink of handing him over for almost certain extradition, according to the country’s former consul general in London, Fidel Narvaez. 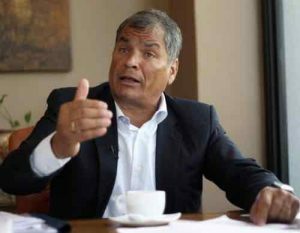 “The government of Lenin Moreno is doing everything to prepare the end of Julian Assange’s asylum,” Narvaez told me. For Narvaez, who was among the Ecuadorian officials who received Assange in 2012, the move is part of a return to a “subservient” foreign policy by the Ecuadorian government under Moreno. “The foreign policy of the Ecuadorian government changed dramatically and it is now completely subservient to foreign pressures, especially from the US and the IMF, as it always was before the Citizens’ Revolution,” Narvaez adds. In light of these and other measures, Moreno’s seemingly imminent move against Assange isn’t surprising, but the timing of it is about more than just appeasing his allies. While he is obviously intent on giving Assange the boot, Moreno might still face a number of legal hurdles. Moreover, Assange is now an Ecuadorian citizen, and the country’s constitution prohibits the government from allowing an Ecuadorian to be extradited. Nevertheless, his crusade against Correa’s Citizens’ Revolution has meant a dismantling of institutions and regulations, coupled with austerity measures that have included massive public layoffs. 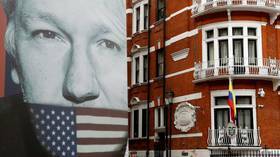 The country finds itself spiraling towards the political instability and disarray that characterized the Andean nation during the 1990s and early 2000s, and therefore laws and process may be insufficient to stop the forced exit of Assange’s from Ecuador’s embassy. Assange is trapped in this Kafkaesque scenario, surrounded by hostility, waiting for his adversaries to determine his fate.